In probability and statistics, a random variable, random quantity, aleatory variable, or stochastic variable is a variable whose possible values are outcomes of a random phenomenon. More specifically, a random variable is defined as a function that maps the outcomes of an unpredictable process to numerical quantities, typically real numbers. It is a variable (specifically a dependent variable), in the sense that it depends on the outcome of an underlying process providing the input to this function, and it is random in the sense that the underlying process is assumed to be random. This graph shows how random variable is a function from all possible outcomes to numerical quantities and also how it is used for defining probability mass functions. A random variable's possible values might represent the possible outcomes of a yet-to-be-performed experiment, or the possible outcomes of a past experiment whose already-existing value is uncertain (for example, because of imprecise measurements or quantum uncertainty). 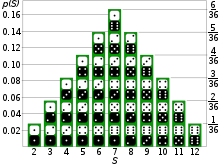 They may also conceptually represent either the results of an "objectively" random process (such as rolling a die) or the "subjective" randomness that results from incomplete knowledge of a quantity. The meaning of the probabilities assigned to the potential values of a random variable is not part of probability theory itself but is instead related to philosophical arguments over the interpretation of probability. The mathematics works the same regardless of the particular interpretation in use. As a function, a random variable is required to be measurable, which allows for probabilities to be assigned to sets of its potential values. It is common that the outcomes depend on some physical variables that are not predictable. For example, when tossing a fair coin, the final outcome of heads or tails depends on the uncertain physical conditions. Which outcome will be observed is not certain. The coin could get caught in a crack in the floor, but such a possibility is excluded from consideration. The domain of a random variable is the set of possible outcomes. In the case of the coin, there are only two possible outcomes, namely heads or tails. Since one of these outcomes must occur, either the event that the coin lands heads or the event that the coin lands tails must have non-zero probability. A random variable has a probability distribution, which specifies the probability of its values. Random variables can be discrete, that is, taking any of a specified finite or countable list of values, endowed with a probability mass function characteristic of the random variable's probability distribution; or continuous, taking any numerical value in an interval or collection of intervals, via a probability density function that is characteristic of the random variable's probability distribution; or a mixture of both types. Two random variables with the same probability distribution can still differ in terms of their associations with, or independence from, other random variables. The realizations of a random variable, that is, the results of randomly choosing values according to the variable's probability distribution function, are called random variates. The formal mathematical treatment of random variables is a topic in probability theory. In that context, a random variable is understood as a function defined on a sample space whose outcomes are numerical values.
. In some contexts, the term random element (see Extensions) is used to denote a random variable not of this form. is called a continuous random variable. In the special case that it is absolutely continuous, its distribution can be described by a probability density function, which assigns probabilities to intervals; in particular, each individual point must necessarily have probability zero for an absolutely continuous random variable. 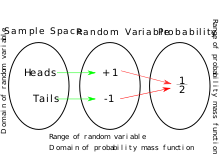 Not all continuous random variables are absolutely continuous, for example a mixture distribution. Such random variables cannot be described by a probability density or a probability mass function. ). In this case, the structure of the real numbers makes it possible to define quantities such as the expected value and variance of a random variable, its cumulative distribution function, and the moments of its distribution. and the position of the 1 indicates the word. matrix of random variables, whose values specify the adjacency matrix of the random graph. , and random field is a random function on any set (typically time, space, or a discrete set). that assigns measure 1 to the whole real line, i.e., one works with probability distributions instead of random variables. See the article on quantile functions for fuller development.
) but there is a positive probability that its value will lie in particular intervals which can be arbitrarily small. Continuous random variables usually admit probability density functions (PDF), which characterize their CDF and probability measures; such distributions are also called absolutely continuous; but some continuous distributions are singular, or mixes of an absolutely continuous part and a singular part. on a randomly-generated number distributed uniformly on the unit interval. This exploits properties of cumulative distribution functions, which are a unifying framework for all random variables. in the target space by looking at its preimage, which by assumption is measurable. (those for which the probability may be determined). The random variable is then a function from any outcome to a quantity, such that the outcomes leading to any useful subset of quantities for the random variable have a well-defined probability. , then such a real-valued random variable is called simply the random variable. has the value "green", 0 otherwise. Then, the expected value and other moments of this function can be determined.
. These are explained in the article on convergence of random variables. and measures absolutely continuous with respect to it. ^ Blitzstein, Joe; Hwang, Jessica (2014). Introduction to Probability. CRC Press. ISBN 9781466575592. ^ a b Steigerwald, Douglas G. "Economics 245A – Introduction to Measure Theory" (PDF). University of California, Santa Barbara. Retrieved April 26, 2013. ^ Yates, Daniel S.; Moore, David S; Starnes, Daren S. (2003). The Practice of Statistics (2nd ed.). New York: Freeman. ISBN 978-0-7167-4773-4. Archived from the original on 2005-02-09. ^ L. Castañeda; V. Arunachalam & S. Dharmaraja (2012). Introduction to Probability and Stochastic Processes with Applications. Wiley. p. 67. ^ a b c d e Bertsekas, Dimitri P. (2002). Introduction to Probability. Tsitsiklis, John N., Τσιτσικλής, Γιάννης Ν. Belmont, Mass. : Athena Scientific. ISBN 188652940X. OCLC 51441829.